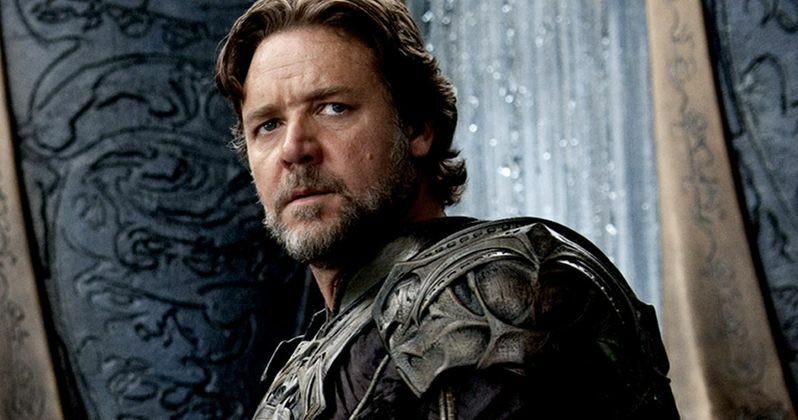 Russell Crowe has confirmed in a recent interview that he will not return for the Man of Steel sequel tentatively titled Batman Vs. Superman. "I don't think they're going to use me again. I think they are jumping onto a different string. They're going with...Different superhero worlds collide..."
The actor played Jor-El in 2013's Man of Steel, and turned in a performance that surprised and delighted fans of the DC Comics superhero father figure. Some might argue that his Jor-El is the best live-action representation of Superman's real dad yet. The decision not to bring Jor-El into the storyline for Batman Vs. Superman makes sense, as it might take too much time explaining how Clark Kent was able to bring his father's A.I. consciousness back after General Zod destroyed it in the first movie. It is possible that the actor could return in flashbacks, but the hope from fans is that more time will be spent on the tension between Bruce Wayne and Clark Kent as their worlds collide.